Choose between French calf leather, produced by Jullien et cie in Paris, and Harmatan Finest Nigerian Goat skin, produced by Harmatan Tannery in Northamptonshire. 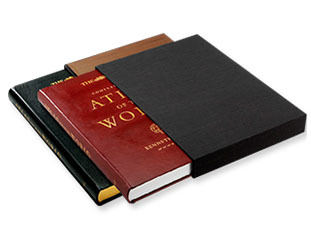 Click here to see photos of the bookbinding process at The Book Works. Ribbon markers in complementary colours are included. 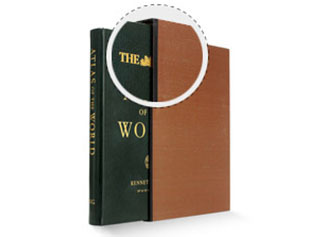 Head and tail bands are strips at the head and tail of the book between sections and the spine covering. 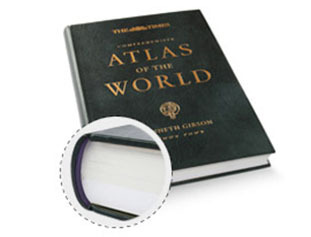 Leather bands come as standard and add a quality finish to the atlas, but for extra luxury choose hand embroidered silk bands. 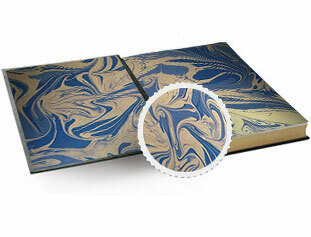 Our beautiful marbled end papers are produced by Jemma Lewis Marbling & Design. The 6 options below are a small selection of those on offer. 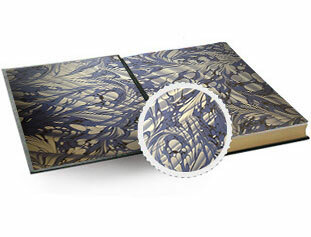 For that extra luxury feel, choose to have the pages' edges gilded in gold. 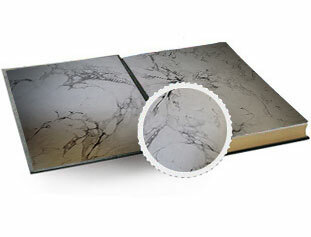 This specialist technique adds a superb finish only seen in top quality books. 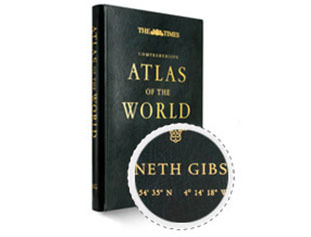 Hand printed gold type on the front gives your world atlas that special personal finish. Choose to show the Times logo, and add your family crest (subject to approval of artwork). Your personal atlas includes a specially designed title page, with a name dedication, date and lat-long coordinates of your choice - all hand letterpress printed on the finest paper. Add your initials using hand printed gold type to give that personal touch. 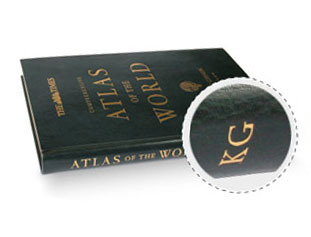 'Atlas of the world' is included as standard on the spine. 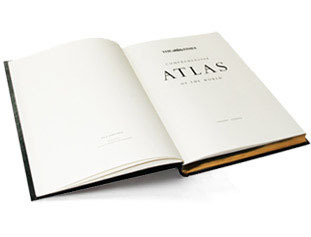 To make your atlas truly unique, add your name (maximum 22 characters on one line) and location coordinates. 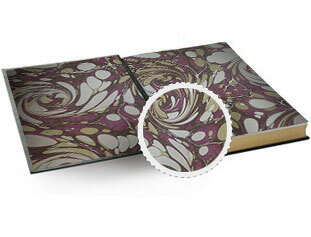 These are hand printed using gold type on the front cover. 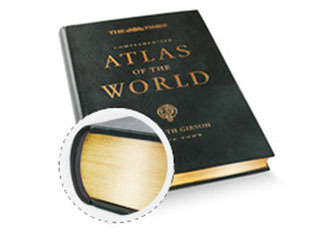 To add that final touch, protect your superb atlas with a specially designed slipcase box. 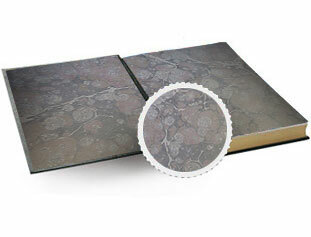 Choose between silk douppion with open edges covered in leather trim, or black Japanese book cloth. 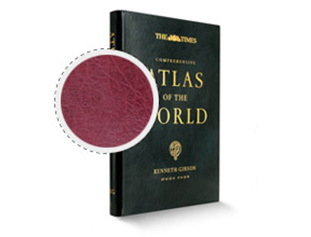 Thank you for your interest in a Special Edition Times Atlas. We will contact you in the next few days to discuss your choices . 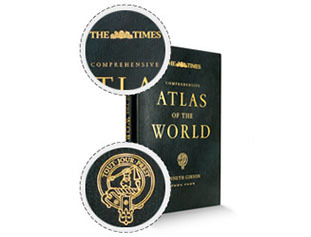 Thank you for your interest in a Special Edition Times Atlas. We will contact you in the next few days to discuss your choices. If you do not hear from us soon, please click here to email us directly.